I am so excited, you guys- it's done! I have been wishing I could get rid of this monstrosity ever since I came into this classroom 2 years ago, but it has taken me this long to finally get up the courage and do some tetris maneuvering to make it happen! While my teacher desk is a great desk, it is just so big. I love doing movement activities and the more open space I can get in my room, the better. Although I had already pushed it up against the wall when I moved into the room, it took up enough wall space that it left no room to put the piano against a convenient wall- which meant that the piano stuck out sideways into the room, cutting off the space. In many ways it was a fine arrangement, but I was getting frustrated with the number of times that I wanted to be able to see over the piano from one side of the room to the other and couldn't. So where did all that stuff go, you ask? Well, it actually got split up into 4 different locations. The first location was the trash can. I went through and ruthlessly threw away anything that I hadn't used in the last 2 years and knew I wouldn't use in the next 5 either, no matter how I thought someone someday might think it's cool. 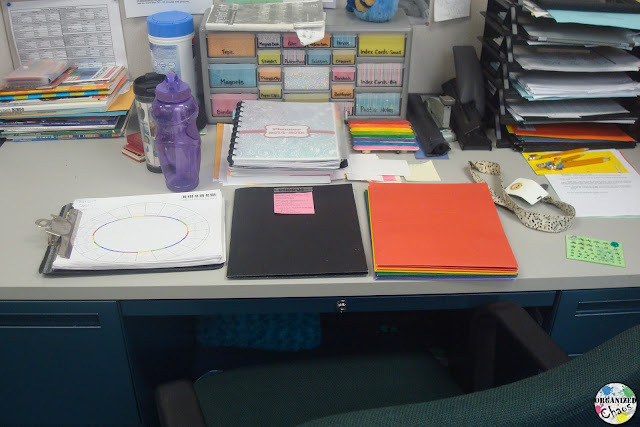 I organized everything by type and activity and laid it out across the shelf so I could quickly grab what I needed. 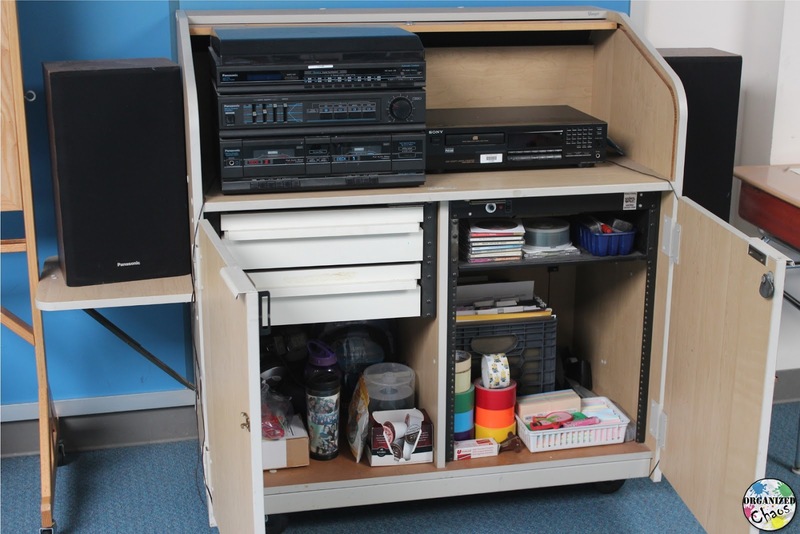 I also put some things in the other rather-large-furniture-item in the room: the speaker cart. When I came into this classroom 2 years ago the bottom cabinet under the speakers was filled with CDs, cassettes, records, and VHS tapes. Yes, you read that right. One of my first tasks a year ago, after confirming that there was indeed nobody still using records, cassettes, or VHS tapes, was to throw out most of it (don't worry, I kept most of the records in a box in the back corner of my closet for nostalgia's sake (and in case I want to do a unit on the progression of music technology or something), and I kept any VHS tapes that were quality material and in good condition). Then I closed the doors on that wonderfully empty cabinet and forgot that I had all of that space for the next year! Thankfully I remembered while I was in the middle of trying to fit all of the stuff from my desk into new storage locations, so the office supplies that I use less frequently, like duct tape, extra erasers, K-cups, and the 3-hole-punch, went in there. I was also able to put a milk crate in the same cabinet to hold all of my files. In the old desk I had lots of papers filed in the filing cabinet drawers, as well as papers in various huge binders, and in piles on my desk. I went through every single paper, threw out a lot (again), and filed the rest in the hanging files, which I moved from the filing cabinet drawer into the milk crate. Much easier! I actually already had this desk in this spot. I kept my computer there because the wires for the projector were on that side of the room, and I had my speakers and microphone set up there as well. I got rid of the giant speakers that were there (which were already being held together with masking tape when I came 2 years ago and were barely functioning) and replaced them with one small bluetooth speaker (the sound quality seems just as good and the wires don't fall out!). 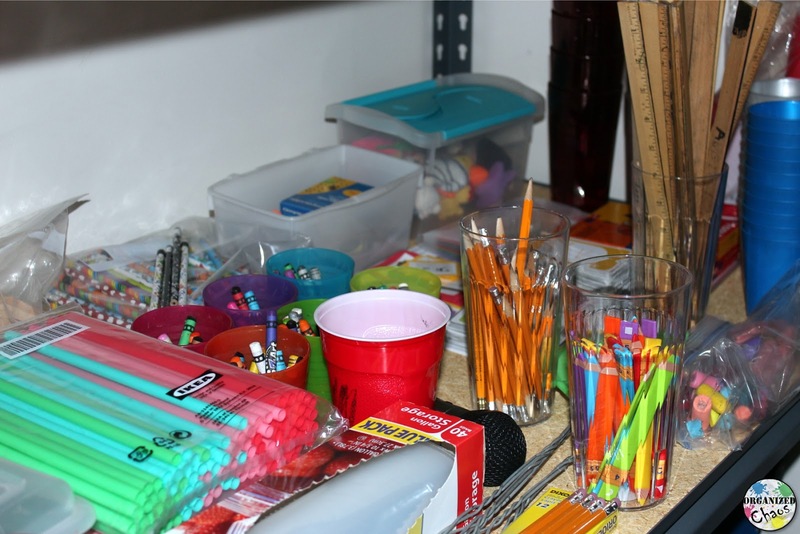 That freed up some room for me to migrate my supply essentials to this work area- my teacher toolkit, letter sorter (on the floor for now), and some extra pens in clear plastic cups (on top of the toolkit). I'm sure my new work area will be getting some love in the next few months, but for now I'm just so happy with this new, streamlined works space, and absolutely THRILLED to be rid of the monstrosity that was my old giant teacher desk! Do you have a giant teacher desk in your room? 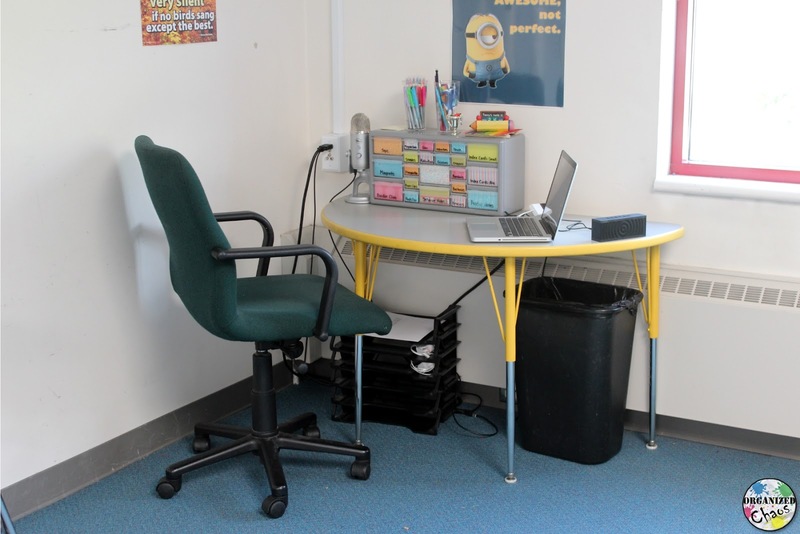 Or do you use a smaller work space like my new one? 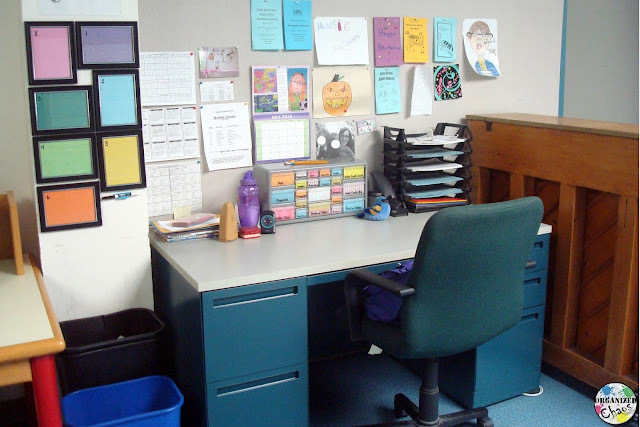 How much space does your "teacher stuff' take up in your room? Ha! Given how much that thing weighs, I'm guessing you could buy several new desks for the cost of shipping that one! I will admit that it is a nice desk- very sturdy, in relatively good shape considering its age- but it's just too big! I can't stand it any more! I too am struggling with letting my nice large wooden desk go. However, I have a tiny room (12x20) and need all the space possible. 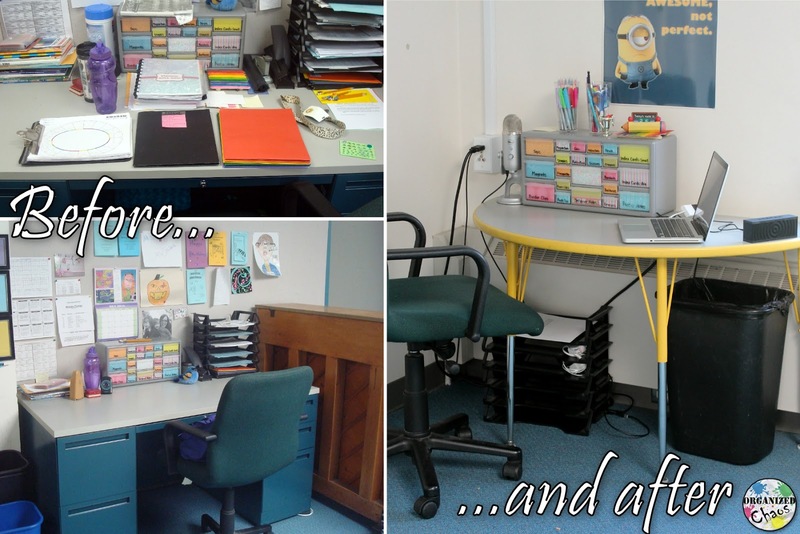 I'm afraid to let the desk go even though I rarely sit there and use it. Perhaps we need to have a teachers desk help group;O) My job tomorrow is to go and clear my desk so that I can have it removed:O( So funny how we can get attached to things! this post is inspiring. I share both of my classrooms with the art program, and "real estate" in the space is rather limited. We share a computer, and really, the top of the piano is slowly turning itself into a workspace. Haha, I've definitely seen those kinds of pianos... Including in my own classroom... ;) Thank you so much for the lovely comment. Sharing limited space can be very difficult. 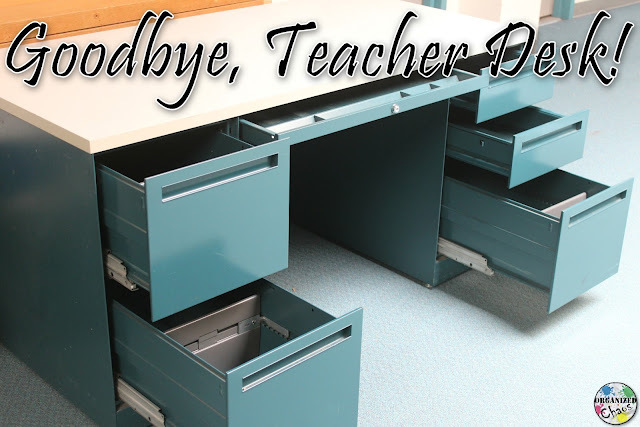 I hope you found some ideas to save space and get organized!